Five Guys, Three Relays, 12 National Championship Rings? Loudoun Valley is apparently not done with records this season. Not only did they shock the country in XC but so far in track they have done that every race as well. 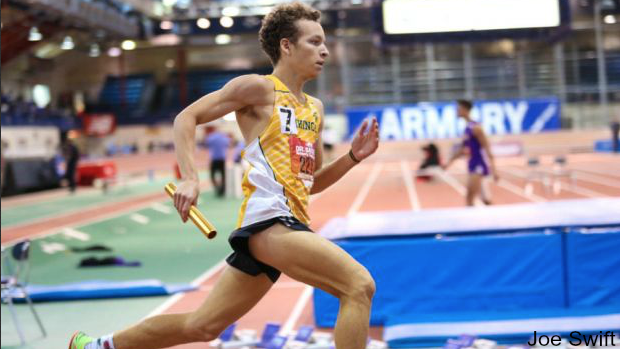 New Balance Nationals will be another chance for them to prove their doubters wrong as they attempt something that has never been accomplished. They will attempt to run and win the 4x800, DMR, and 4xMile relays. The team of Sam Affolder, Jacob Hunter, Connor Wells, and Colton Bogucki will race in both the 4x800 and 4xMile relay. Akere Simms though will replace Hunter in the DMR to carry the baton for the 400m leg. The easiest of these relays will come first, the DMR. They currently own the US #1 mark in this event from the VA Showcase and are looking to break the national record. They will have competition so it is not a walkover but this shouldn't pose too much of a threat to them. Next up will be the 4xMile race. Here they have a 4:09, 4:19, 4:19, and 4:21 leg (1600). That equates to a 17:08 4x1600 and a 17:14.98 4xMile. The national record in this event is 17:07.17 which means it is also in danger of falling. The final race though will be the toughest for the Vikings. Just five hours after the 4xMile they will toe the line in the 4x800m relay where they are the second seed by .30 seconds. They will have to push with everything they got to even reach the podium and will have to run the best race of their entire year to win the event. If Loudoun Valley were able to pull this feat off it would shatter all their other accomplishments. This would be another piece of proof in their case to be considered the greatest group of distance runners for a single school in HS history.